NEWINGTON - Reno Machine Company Inc. is a family business that specializes in large-part precision manufacturing for various industries. The company was established in 1957 by Antonio Occhialini and Albert Reney. Reno’s 80,000-square-foot facility is located at 170 Pane Road. While the quality of the product has remained the same, the services offered at Reno have changed over the years. Sixty-one years ago, when the company began, it was focused on tooling and small support hardware. Over the years, as the industry evolved, Reno Machine started to concentrate more on larger component parts and fixtures. Over the last few years, the company has invested in new equipment such as five-axis high speed machining. “We are now doing a lot more business with the composite components for jet aircraft engines both military and commercial,” Mark Occhialini, Reno’s president, said. 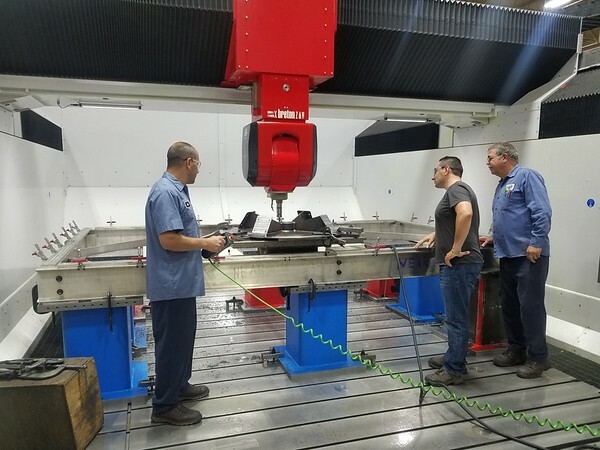 Reno recently purchased a new Breton five-axis high speed machining center with a machining capacity of 157 inches by 118 inches by 59 inches and spindle speed of 28,000 revolutions per minute. Reno supports the aerospace, armament, marine, power generation and research industries. The company also manufactures molds for composite parts and has the capacity of handling large-scale components turning up to 144 inches and milling up to 410 inches by 93 inches by 84 inches. Pratt & Whitney Aerospace Company, Sikorsky Aircraft and UTC Aerospace Systems are among the biggest customers that Reno works with. In addition, Reno has a division that serves as a design group in Farmington. This division, called Design Company (Deco), offers tool designs, process planning and coordinate measuring machine (CMM) programming. The design facility is located at 3 Waterville Road in Farmington. Reno employs 70 people. Dave Derynoski, Reno’s sales manager, has held his role for two years. Derynoski said it is a challenge for the company to find qualified workers but the company is willing to train individuals with a passion for the industry and a desire to learn. The team at Reno strives to be competitive by making quality parts and delivering on time. The company upholds the founders’ commitment to the highest levels of service and support. To learn more about the services provided at Reno call 860-666-5641 or visit www.reno-machine.com . Posted in The Bristol Press, General Business, Manufacturing on Monday, 1 October 2018 20:42. Updated: Monday, 1 October 2018 20:45.